Total Visual SourceBook includes 227 modules and 125,000+ lines of royalty-free source code you can use immediately! Total Visual SourceBook is the most extensive professional source code library for Microsoft Access, Office, VBA, and Visual Basic 6.0. Written by our staff of Microsoft MVP's, authors, and experienced developers, much of this code can't be found anywhere else. All the code in Total Visual SourceBook is designed and written specifically for this library. This is not a compilation of mismatched snippets of dubious quality taken from the Internet or code from other projects dumped into this. The code in Total Visual SourceBook is written for the needs of a developer using a source code library covering the many challenges you face. The code has a consistent programming style, naming convention, and comments. All the code is well tested and documented so you can use it immediately and with confidence. Total Visual SourceBook is integrated with your VB6 and VBA IDE. Start it as an add-in and its always ready to insert code directly into your project, or import your code into the powerful Code Repository to share with your team. Every major area of software development is covered. From ADO to XML, with 227 modules, 3,600+ procedures, and 125,000+ lines of code in 55 categories, Total Visual SourceBook solves many common and complex programming challenges you face. Extensive documentation is provided with 25,000+ lines of examples showing how the code is used. Here's an overview of the code categories, and a complete list of all the modules and classes with their descriptions. You can treat our code as a black box and simply insert it into your projects and call it. Or you can learn from our techniques by examining it line by line. And because it's source code, you can enhance it any way you'd like. Countless developers over the years have told us they learned some or much of their development skills and tricks from our code. You can too! Why write code we've already written for you? Total Visual SourceBook has one of the highest return on investments of all our products. Subject to the licensing terms, you can include our code in any or all of your projects Royalty Free. Even if you are an experienced developer, there are probably several classes and modules which are new to you. All it takes is a few to solve some critical problems to pay for the entire product. You can then treat the rest of the code as "free". It wasn't always easy, but we designed every class and module to be independent. You only need to add one object to your project to solve a task without a bunch of dependencies. This lets you choose only what you need and remain productive. All the procedures include basic error handling. If you have your own error handling structure, our Code Explorer lets you easily replace ours with yours. The Code Explorer is designed to make it easy for you to find and insert the code in Total Visual SourceBook into your project. To see how intuitive and powerful it is, read our Overview and Screenshots page. Tired of digging for code you know you've already written? Use the Total Visual SourceBook Repository to store, index, and manage all your code in a shared environment. Your team's source code is one of its most important assets. Leverage your existing work by having your experienced developers store their custom code in the code repository for everyone to share. It tracks author, creation and modification dates, comments, examples, and more. You can even set it so others can't modify your submissions. The repository makes it easy to search and find the code you need. Eliminate the chance that people spend countless hours writing work that already exists and is tested and better! Total Visual SourceBook is available in different versions depending on your version of MS Office/Access. The 2013 version runs in Office/Access 2000 through 2016, but much of the source code only works in Access/Office 2010-2016, especially the code that supports 32 and 64-bit versions. The Total Visual SourceBook 2007 version remains available and part of the 2007 Suites. If you are using Office/Access 2003 or earlier and don't have plans to migrate to 2007 or later, you may prefer the 2003 version. Microsoft Office 2016, 2013 and 2010 are available in 32 and 64-bit versions. The source code library in Total Visual SourceBook 2013 is compatible with 32 and 64-bit Office/VBA. Unless explicitly specified, all of the source code can be inserted into your projects and will work for users running either the 32 or 64-bit version of Office/VBA. This makes it easy to support your users without worrying about which version of Access/Office they installed. Note the Visual Basic 6 specific code is only 32-bit compatible since VB6 does not have a 64-bit version. 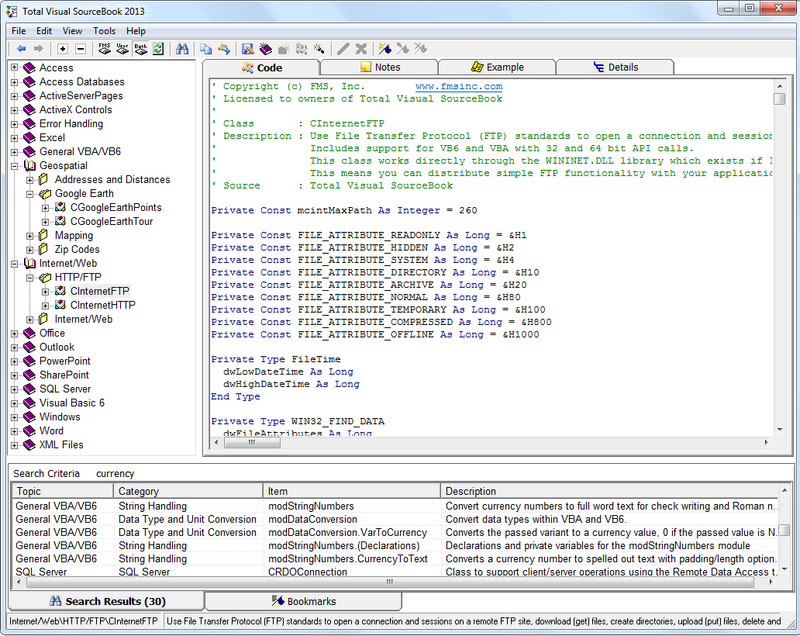 Total Visual SourceBook 2013 runs as a standalone program or as an add-in to your VBA/VB6 IDE. The add-in can only run within the 32-bit version of the IDE. If you are using the 64-bit version of Office, Total Visual SourceBook still works on its own, but not within your IDE. Source code library material is redistributable royalty-free. It must be contained in an application that is compiled and the Total Visual SourceBook library code is not redistributed in a readable form. Total Visual SourceBook is licensed on a per developer basis. Each developer who runs the program and uses the code must have a license. Read the License Agreement for details. Supports Access/Office 2016, 2013, 2010 and 2007, and Visual Basic 6.0! "The code is exactly how I would like to write code and the algorithms used are very efficient and well-documented."